I realized the other day that I've never shown you any of the murals I've done. 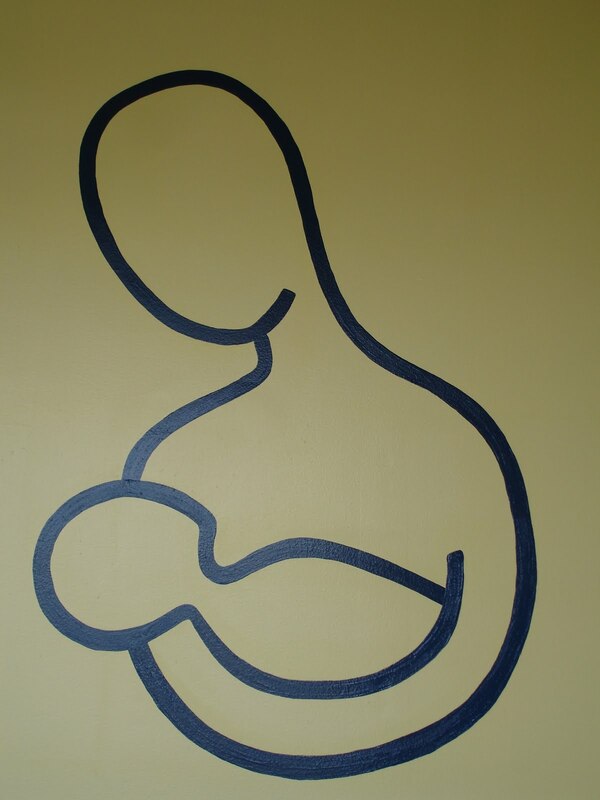 This is a mural I did in a local pediatrics office. along the length of the wall. Rocky Mount, Piney Flats, TN. to keep the kids occupied and distracted while waiting to see the doctor! Tipton Haynes, Johnson City, TN. This wall is about 45 feet long and 9 feet tall. It took me 2 weeks to paint this mural. The grass alone took one full day. Knob Creek Church of the Brethren, Johnson City, TN. The Covered Bridge, Elizabethton, TN. Below is another mural in another local pediatrics office. As you can see, this one is much more stylized. This wall is about 65 feet long by 9 feet high. This mural took 3 weeks to complete. Below is a castle mural that I did in a private residence. This was my first mural ever, incidentally. Below is a little decorative accent mural that I did in another private residence. By adding shadows behind the ivy, I made the leaves seem as if they are popping off of the wall. 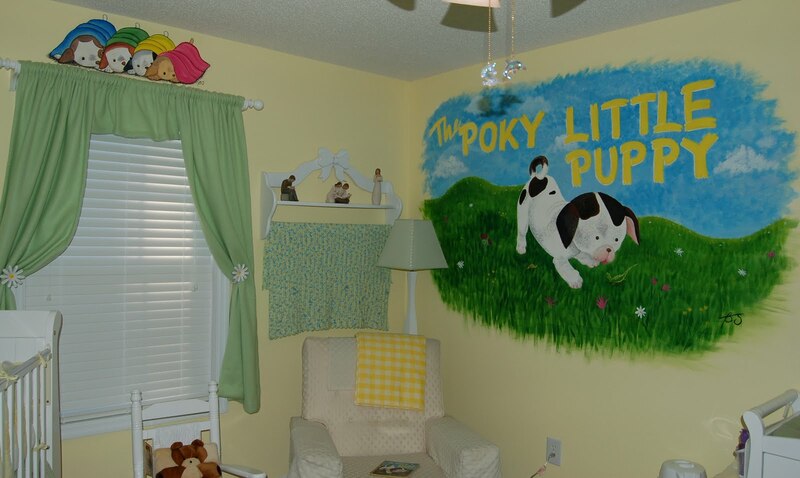 after they moved to a new house, I came and did the same mural again in their daughter's nursery. 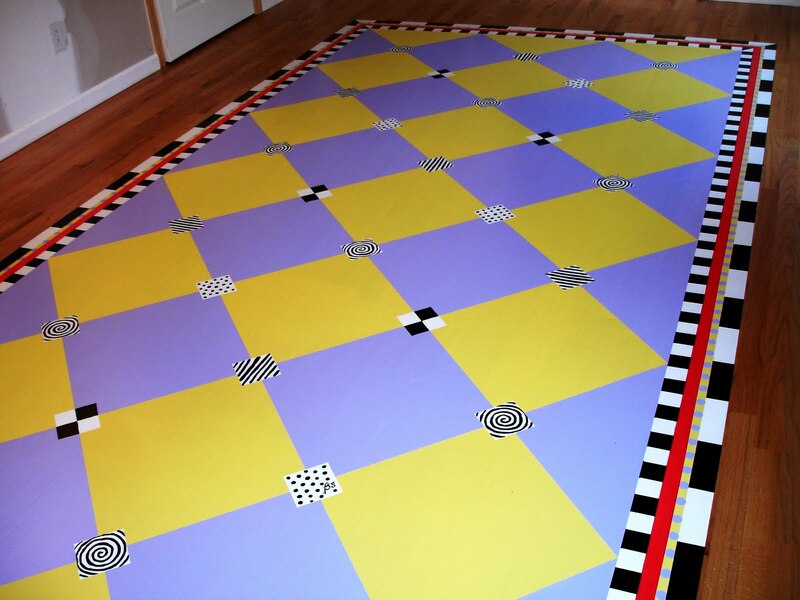 Below is a "rug" I painted on an unfinished wooden floor. After I painted, they varnished over the top. The rest of these are from a retreat center in Buladean, NC. As you can see, words alone can be lovely murals. please e-mail me! If you are local, I offer free estimates and on-site consultation. If you are further away, I am happy to look at your photos and room dimensions and discuss your project with you over the phone. For more information on murals & pricing, please visit my website, and go to the "Information > Pricing" tab. A mural would make a fantastic and unique Christmas gift! Your work is outstanding! So much better than most of the mural art I've seen. My favorite is the Autumn scene with the church. I saw these on Flickr earlier and I'm so glad you posted about them. I'm really amazed and impressed. pattern will result in a modern/eccentric mosaic.